“The people who built the farmworkers movement created an international fulcrum powerful enough to force the largest and most virulent anti-union industry in California – Agribusiness – to beg Governor Jerry Brown in 1975 to convince Cesar Chavez to accept the proposed Agricultural Labor Relations Act. How could this be possible?” Question posed by LeRoy Chatfield. I believe the power of love and the selfless example made everything possible. The example of Cesar Chavez and the striking farmworkers played out over and over again passing from one person to another and another until six million people stopped eating grapes – a miracle – a miracle of love and of truth. I was touched by this miracle in 1972 when a UFW boycott organizer, George Sheridan, showed up in my home state of Connecticut. I had recently graduated from college, was angry we were fighting a war in Vietnam, and was frustrated by what seemed like ineffective “solutions” to poverty, hunger, and racism. My then boyfriend, later husband, Ken Schroeder, invited George to speak to a group of student and labor activists in our hometown, Torrington, Connecticut. George brought a slide show called “Fruits, Vegetables, and People.” He talked about the lives of the nation’s farmworkers – about how they suffered so that we could have fruits and vegetables to eat. He told us about how farmworkers were mistreated by their employers – Agribusiness – and he told us about a union for farmworkers that had been started by a man named Cesar Chavez ten years earlier. He also told us that although he worked full-time for this farmworker union, he received no salary. Neither did Cesar Chavez or any other UFW staff. His compensation was “room and board and $5 a week.” So, we fed him – this emissary of hungry farmworkers and their leader, Cesar Chavez. That’s how it started for me. During the next two years, Ken and I visited churches and unions in Torrington asking for support for the farmworkers’ cause. On weekends our farmworker support group went to supermarkets to pass out leaflets and to ask people not to eat non-union grapes and lettuce. The idea was to put economic pressure on growers to sign union contracts. At that time, farmworkers had no right to an election to select union representation and growers had responded with violence to their attempts to strike to gain recognition of their union. The violence and injustice against farmworkers fueled my growing involvement with the UFW. This experience of injustice quickly became more than theoretical. Shortly after our first meeting with George, I went to the Finast supermarket, located in the Torrington Shopping Center, with leaflets on a Saturday morning. A few days prior, our group had met with the Torrington police chief to inform him that we were beginning a leafleting campaign at supermarkets and to inform him about a recent Supreme Court decision that ruled that shopping centers were public for the purposes of leafleting and petitioning, as well as for shopping. I began to leaflet and talk to customers on this Saturday morning. I had been there only a short time when I was approached by a beefy security guard who told me to leave. I told him about the Supreme Court ruling and my right to be there. He told me again to leave or be arrested. I left, called Ken, and together we went back to the police station. The chief wasn’t in so we talked to the officer in charge about the incident. His response? “This in Torrington. We don’t care about the Supreme Court here.” Appalled, we left. Later that week we returned to the police station, spoke again to the chief, and were back at the Finast supermarket the next weekend. Finast became one of the first supermarkets to stop selling non-union grapes in New England. We then turned our attention to the A&P supermarket chain, where our Torrington farmworker support group spent Saturdays for over a year. Our goal was to convince people to not eat grapes and supermarkets to not sell them. Our strategy included education and action to bring people along step by step. We began with talking to people and encouraging them to read our literature and to not eat grapes. This work was supported by personal visits and speaking engagements at churches, unions, and other community meetings. Over time, we would ask people to sign letters or petitions to supermarket headquarters asking them to not sell grapes. We also asked shoppers to speak to their store managers. As customers made these reasonable requests and were met with indifference, resistance, or even hostility, their commitment to farmworkers and the grape boycott grew. In time, many customers became willing to stop shopping at supermarkets that persisted in selling grapes. Films and personal testimony also played a role in our education efforts and in my own growing commitment to the union. In 1973, union staff organized a film showing and speaker in Hartford, CT. The film was “Salt of the Earth” – the speaker was to be Dolores Huerta. Dolores was unable to make it. A farmworker named Maria Zuniga Maddock spoke instead. “Salt of the Earth” tells the true story of a strike by Mexican-American miners in New Mexico that was won by the women who were the wives of the miners. Those involved in making the film in the 1950’s were blacklisted by Hollywood. After the film showing, Maria told the story of how she and her mother attended a UFW meeting and, inspired, planned to return, only to be forbidden to do so by her father. The women went back anyway. I began to see the farmworkers’ union as a place where women could grow and become leaders. As this awareness was growing, my disenchantment with my job in the social work field was growing. And a UFW organizer named Chris Byrne had moved in with a group of us who were sharing a house. He began inviting Ken and me to UFW staff meetings in Boston. We met more people and were asked to join the full-time staff. By this time, I had a clear sense of the Union as a social justice organization that could get things done and that was making a difference. Ken and I decided to join the full-time staff. 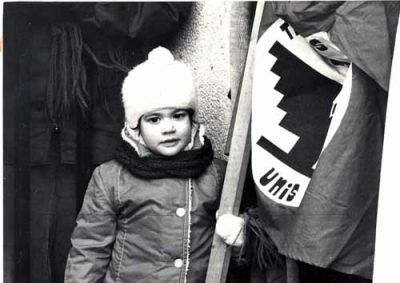 July 8, 1974 was my first day as a UFW staff member. I was assigned to build support for the boycott in New Britain, Connecticut. George Sheridan gave me a stack of index cards with names and phone numbers of people who had supported the UFW in the past in New Britain and suggested I start on a street that was home to several union offices. Ken dropped me off on the designated street and went on to the next city with arrangements to pick me up in several hours. The day was 90 degrees and humid. I began walking down the street. At the first union office I came to, I went in, introduced my mission and myself and asked for a space to work. Within a short time, I was sitting at a desk in the union’s office making phone calls to the names on my index cards. Within a few days, I had office space in a local church. It is important to note that this second grape boycott that I participated in, built on the work of farmworkers who had worked on the first grape boycott in the mid-1960’s. Their work paved the way for our efforts. People remembered and were willing to help again. Three weeks into my full-time work with the Union, Cesar Chavez visited New England. I had never met Cesar. There was a lot of preparation for his visit – rallies and meetings to organize. Lots of people were jostling to get close to him so that they could get their own messages to him and through him to others. One of those folks was the leader of a new union that was organizing primarily Puerto Rican farmworkers who worked in Connecticut’s tobacco fields. There was a big rally in Hartford one night. As I recall, the leader of the new farmworkers union was not on the program. Another speaker introduced him and then he came to the stage unexpectedly and spoke. Cesar responded with praise for his efforts and hopes that they could work together. Grace and political astuteness were my first impressions of Cesar. Our nemesis, A&P, was slated for a big rally with Cesar in attendance during his visit. This, finally, was too much for them. Hours before the rally an agreement with A&P was reached. A&P would stop selling grapes in all of New England! After Chavez’s visit and the victory with A&P, there were not many grapes being sold in New England. Most of the supermarket chains were cooperating with the consumer boycott. In response, grape growers were shipping ever-increasing quantities of grapes to Canada, already a big grape market. Within days of Cesar’s visit, Ken and I were reassigned to the Montreal boycott. Our staff in Connecticut had been few and spread out. 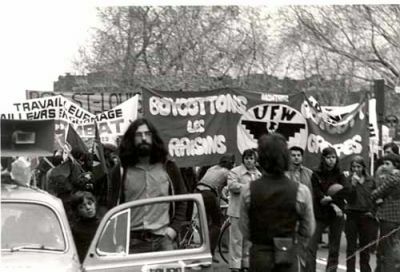 In Montreal, not only was the city bigger, but the UFW staff and community were also bigger. 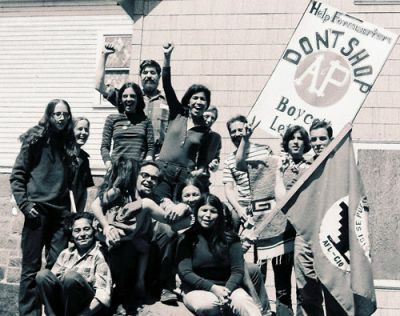 There were eleven of us when I arrived in September 1974: our director and his girlfriend from New Jersey; three farmworker organizers from Lodi, CA. ; two Canadians; two Germans doing their alternative to military service with the Union; and Ken and myself from Connecticut. In later months, staff from France and Ireland joined us. Again, we were not starting from scratch. Jessica Govea and others had organized in Montreal during the first grape boycott. People were familiar with the issues and ready to become active again. What drew people in? I believe the community and sense of family had a lot to do with it. After every picket line, there was a potluck and singing at the boycott house. We sang labor and civil rights songs in French, Spanish, English, and German. And for those who didn’t attend the potlucks, the shared experience of standing in the cold and snow at supermarkets talking to customers created a bond. During our second winter in Montreal we had 120 inches of the white stuff. Not everyone picketed and leafleted at supermarkets. That was one of the beauties and strengths of our organizing campaign. There was an activity and a way to help for every one of any age or interest. Some people raised money. Others gave money. Some people organized house meetings by gathering friends at their homes. Others attended the meetings. Some got their unions to donate paper and ink for our leaflets. Others got their ministers and priests and rabbis to put notices in weekly bulletins or to allow us to speak about the farmworkers cause at services. Others took the simplest and most powerful step of all: they stopped eating grapes. Many of us grew in our activism. I certainly did things I was afraid of doing. But they were small steps compared with the risks farmworkers took every day simply by showing up to work. Others were similarly inspired. In the suburbs of Montreal, known as the West Island, I worked with two such women who got involved through their church. From the beginning, these two women expressed their reluctance to picket or leaflet at the stores. They contributed by working with their minister to spread the work throughout their church community. In time, they agreed to pay a visit to the manager of their local Dominion supermarket where they had both shopped for many years. They met with the manager and asked for his support. His response was rude and hostile. After this encounter, one of the two women began to accompany me to the Dominion stores on Saturdays to circulate a petition and to leaflet. The other continued her less visible support. That, too, would change in time. Throughout the fall and winter of 1974-75, more and more supermarket chains in Montreal, large and small, agreed to stop selling grapes, until only one chain was left – Dominion – the largest chain in Canada. The Union became engaged in a fierce battle with Dominion. More and more customers stopped shopping at Dominion and took their business to the stores that were cooperating with the boycott. As sales dropped, Dominion turned to the police and the courts for relief. They got an injunction that prohibited picketing within 10 feet of their doors. On one occasion, we organized a large rally at a Dominion store. Business at the store dropped to almost nothing. The police came en masse and asked us to move from the store parking lot to the sidewalk. A long line of police in riot gear watched and waited as we walked peacefully to the sidewalk. Cesar Chavez planned a trip to Canada during this time. We organized a march to a Dominion store, which he would lead. The afternoon he arrived, a court granted Dominion an injunction prohibiting us from talking about farmworkers’ rights within 100 feet of any property owned or occupied by Dominion stores. This put our march in the next block, for the street in front of the Dominion store was within 100 feet of their parking lot. A debate ensued among union leadership over what to do. Should Cesar lead the march, break the injunction, and risk arrest? What other options were there? Another plan was created. We would go ahead with the march, but we wouldn’t talk about farmworkers’ rights within 100 feet of Dominion. We wouldn’t talk at all. We would march in silence. We worked all night to create new picket signs and banners for the march. The next morning, Cesar led hundreds of Montreal boycott supporters down the street towards the Dominion store. A couple of hundred feet from the store, stationary signs began to appear, held by volunteers with fingers held over their lips in a gesture of silence, “Danger – Approaching Dominion”. At the 100-foot mark, a huge banner declared, “Dominion – an Island of Oppression on a Sea of Justice”. The names of the cooperating supermarkets were scattered throughout the sea. As Cesar led the marchers into the 100-foot zone, he stuffed a handkerchief into his mouth. All sound stopped – the voices, the chants, and the music. Someone raised a fist in the air. The gesture spread through the crowd marching and through the spectators watching from their high-rise apartments along the route. And among those with raised fists were my two friends from the West Island. Sometime after this, if my memory of the order of things is correct, the UFW marched on the Gallo winery in Modesto, California, thousands strong. We heard about the march in Montreal, the news conveyed through UFW headquarters at La Paz. Not long after that march, California growers agreed to legislation – the first of its kind in the nation – which granted California farmworkers the right to an election to select union representation. Attention shifted from the boycott to elections in the fields and later to legal battles as growers broke the new law. I worked eventually as a paralegal in California and later as a negotiator and contract administrator. The farmworker community in Delano became family. But nothing was as extraordinary as my time on the boycott and being part of a six million person miracle.